Jan. 19 was a huge day for the University of Wisconsin Men’s Basketball Team (17-6, 9-3 Big Ten). At the time, conference rival Michigan (21-2, 10-2) was ranked No. 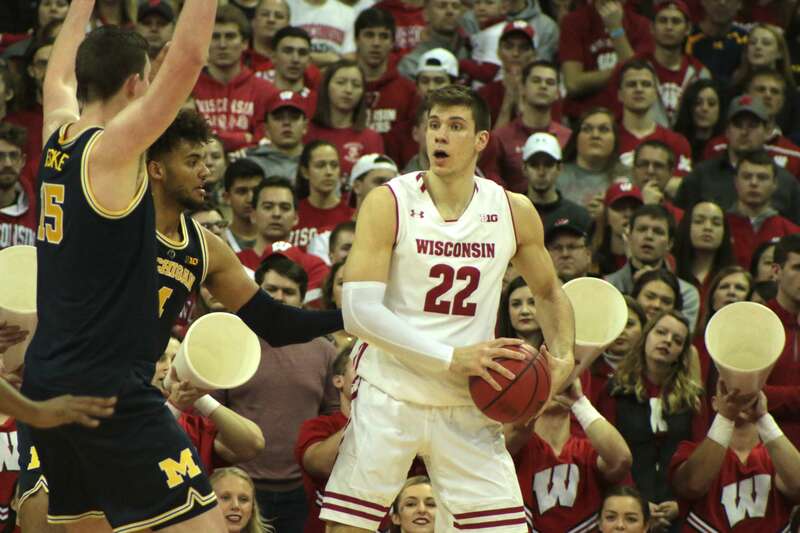 2 in the nation, but a 26-point outing from Ethan Happ dethroned the Wolverines. The upset marked a major turning point in Wisconsin’s season, sparking a six-game winning streak that has seen the Badgers jump back in the AP Top 25 and move up to No. 19 in the country. But that game was in the Kohl Center. When Head Coach Greg Gard and company head to Ann Arbor, Michigan, Saturday, they’ll be facing a now No. 7 Michigan team looking for vengeance. The Badgers have already proved their slowed-down, grind-it-out playing style can disrupt Michigan’s offensive rhythm. The Wolverines — usually consistent from three-point land — were held to just a 27.8 percent clip from downtown Jan. 19. If Wisconsin wants to take them down on the road, they will need to employ similar defensive tactics, especially on freshman forward Ignas Brazdeikis. Many predicted that it may take Brazdeikis a year or two to produce at the college level, but thus far, he has proved his doubters wrong. Averaging over 15 points and five rebounds per game, he has become a force to be reckoned with as the leading scorer on a well-rounded, well-coached Wolverine offense. And though the Badgers held him to his only scoreless outing a few weeks ago, he mustn’t be taken for granted. 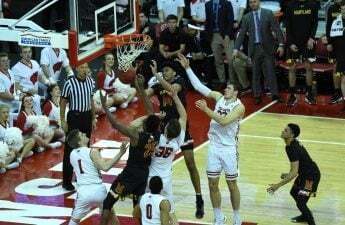 Defenders like Khalil Iverson, Aleem Ford and Nate Reuvers will all have to constantly keep a hand in his face to slow down the 40 percent three-point shooter. Another man Wisconsin will need to key in on is Jordan Poole, a Milwaukee-native. Poole has been hitting big shots his whole career, and like Brazdeikis, is a 40 percent-plus three-point shooter who can pull up from anywhere. His confidence and overall swagger are unparalleled in the Big Ten. Coming off three straight games with at least three three-pointers, UW can expect him to have the green light Saturday. Other big names for Michigan include Charles Matthews, a physical guard who loves to bully his way to the basket, and Zavier Simpson, who leads the team in assists at six per night. While Wisconsin does match up pretty well with the Wolverines, there’s one spot on the floor in particular where Bucky has a distinct advantage — the center position. We know all about Happ’s unique abilities, but while Michigan center Jon Teske is no slouch, he’s also not an All-American. Even at 7-foot-1, Teske likely won’t be able to keep up with Happ’s footwork or post moves. Their first matchup was arguably Happ’s best game of the season, finishing with 26 points, nine rebounds and six assists. He’ll be the focal point of the Badger offense per usual, but he can’t be the only source of offense if they want to pull off another signature victory. In addition to Happ, Wisconsin will need others to step up shooting-wise, most notably Brad Davison and D’Mitrik Trice. 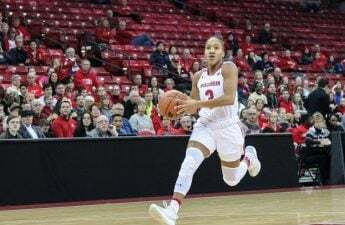 They will be going toe-to-toe with Michigan’s duo of Poole and Simpson, so big performances are crucial from the Badger backcourt. Going on the road is never easy, especially when playing at the Crisler Center. To win, Wisconsin will need to play good team basketball and keep their hands in the faces of Michigan’s shooters. A victory on the road versus a top-10 team would be yet another pivotal moment in Wisconsin’s season and would arguably cement their case as one of college basketball’s finest teams. Tip-off is set for 11 a.m. Saturday morning from the Crisler Center. The matchup can be seen live on FOX or heard on the Badger Radio Network.